Euro 2016 live soccer / football scores, live group tables and more directly from the source, the 1st live score service on the Internet, powered by LiveScore.com since 1998. This Euro 2016 application comes directly from LiveScore, the leaders and inventors of real-time delivery of live sport data and owners of the no.1 ranked football / soccer web site globally. Enjoy the excitement of LiveScore Euro 2016 on your iPhone, iPod Touch & iPad same way that 45 million users are enjoying our existing online services every month, and become part of our network. Our standard LiveScore iPhone, iPod Touch and iPad application has been downloaded by 4 million users and consistently ranks as no.1 Sports application in +/- 25 countries. 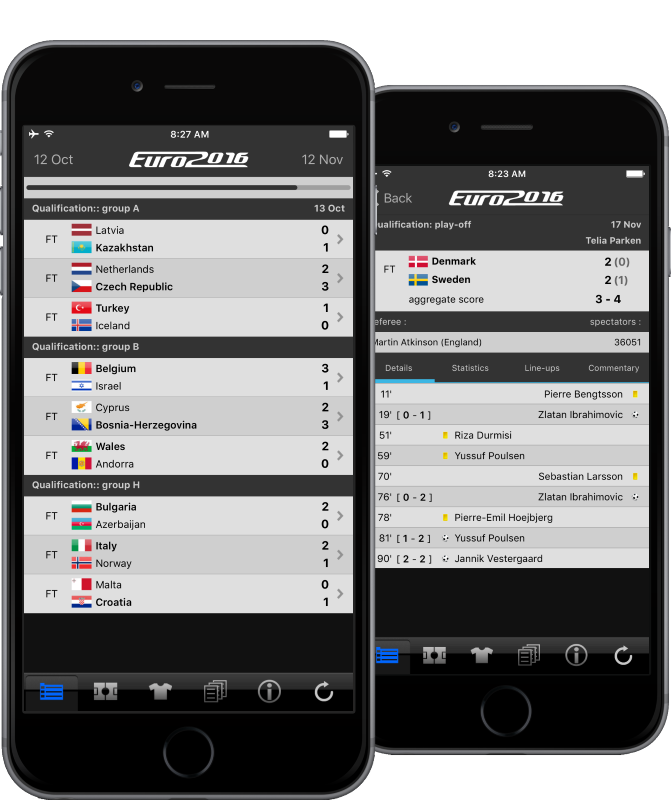 You can all now enjoy Euro 2016 in France in more detail on our latest product, the LiveScore Euro 2016 App. iOS 6.0 (or higher) required.